Rural Revolution: "Don't you realize you cannot make your own heart beat?" "Don't you realize you cannot make your own heart beat?" 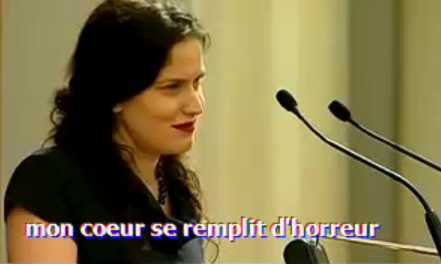 Here's an amazing clip sent by a friend of a woman giving a talk to a French audience (in English - French subtitles). She is a survivor of a botched saline abortion. It's a long clip - 15 minutes - and I started out watching it dutifully. I ended up riveted. UPDATE: So sorry! I forgot to include the hyperlink. It's in place now. How do you get to the clip? I can't get a link to the video. When I click on the picture, I only get a larger picture! Please try again Mrs. Lewis. There is nothing to link to. Thanks. I'm guessing the three comments above were left before you fixed the link (if not, it's in the text, not the picture). I am glad you shared this with us. I realize that I have been neglecting the fight, so to speak, living my own life and not making any attempt to make a difference. To say this moved me is putting it very mildly. I wept with joy for this beautiful young lady, and with sadness for the multitude of unborn murders being performed every day. As Jesus said, and it is obviously still true today, many have hardened their hearts and are blind to the truth. That's how they are able to do so many terrible deeds with no conscience. Also, I hope you can continue to share such wonderful clips w/ others. God Bless you!!! How precious each unborn baby is, I don't understand the coldness of a heart that can abort these innocent little ones. Thank you for this video. I am enjoying your blog. Gianna has an amazing testimony. She visited out city in Australia a couple of years go and we went to hear her speak, it was definitely worth it!